Pima cotton - valued for its high-quality strong fibers - made a splash in California's San Joaquin Valley in the 1990s, reports Hiroko Tabuchi in the New York Times. 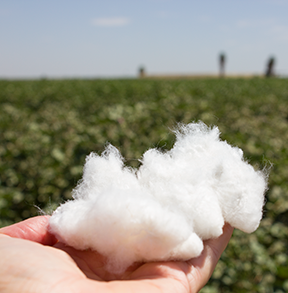 Durable and lustrous, Pima cotton became the fiber of choice for premium shirts and bed sheets. Long hot, rain-free summers made the Central Valley an ideal location for the crop. But environmentalists wondered whether it made sense to plant the thirsty crop in the dry San Joaquin Valley, particularly one used for luxury clothing and bedding, not food, the article said. “It's the world's finest cotton,” said Jim Neufeld, a third-generation cotton farmer in Wasco. This season, he planted 250 acres of cotton, down from a peak of 11,000 acres in the 1990s. “It simply doesn't fit into today's environment." Rising cotton futures are spurring farmers to plant more cotton in California this year, according to an Associated Press report. 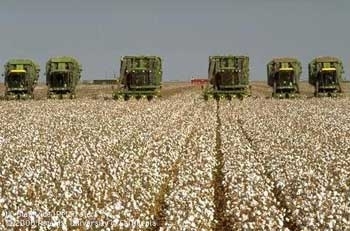 Commodity futures for cotton rose to $1.50 per pound in August, triple the price in 2008. Long-term cotton futures are now around $1, but extra-long-fiber Pima cotton prices are closer to $1.30. "Those are kind of unheard of prices, and people are saying they could be conservative," Kern County farmer Jim Crettol was quoted in the story. He expanded his Pima cotton crop 60 percent to 600 acres and would plant more if he hadn't converted land to grapes and almonds when cotton prices fell. Known in the 70s as "King Cotton," when acreage in the Golden State peaked at 1.6 million, cotton planting tumbled to a low of 200,000 acres two years ago. In 2011, forecasters believe 400,000 California acres will be planted to cotton, primarily Pima varieties. 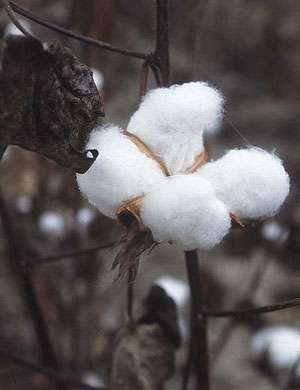 Pima cotton is used in luxury products, such as high-end sheets, towels and clothing. Director of the UC Agricultural Issues Center at UC Davis, Dan Sumner, told AP reporter Jeff Nachtigal that consumers probably won't notice the price difference. "Consumers will see a modest increase in prices when they buy a shirt or sheets. But it won't be a big change, because most of the cost is in processing and marketing," Sumner was quoted. Renewed interest in cotton is trickling down to tractor sales and repair businesses, Nachtigal reported. Thomason Tractor Co. of Firebaugh has sold five new John Deere cotton pickers after selling none for three years. Kern Tractor Supply in McFarland has seen a 5 to 10 percent increase orders for parts for equipment to plant and harvest cotton. Last year, farmers sold used John Deere cotton pickers to scrap iron yards for as little as $1,400. One of the same models was listed on eBay last week for $6,000, the story said. Short supply and stronger demand globally are driving a cotton resurgence. California farmers are known for growing some of the world's finest cotton. Even though, production has been on a steady downward decline since a high of 1.3 million acres in 1979. This year, only about 200,000 acres of California cotton are being cultivated. The drop can be attributed to a number of factors, according to an article today in AgAlert about the repercussions for the cotton ginning industry. Nearly two-thirds of the cotton gins that operated in California 10 years ago have closed. Severe water shortages, competition from other countries, high input costs, the worldwide economic crisis are undermining the throne of California's King Cotton. AgAlert assistant editor Christine Souza spoke to UC Cooperative Extension cotton specialist Bob Hutmacher for the story. "One of the things that has not helped in the last couple of years is some of the prime production areas for cotton are where we have had these tremendous water limitations," Hutmacher was quoted in the article. "That punched the daylights out of cotton acreage as much or more than anything else." Hutmacher is director of UC's West Side Research and Extension Center, which sits in the heart of cotton country. Like neighboring farmers, the center received only 10 percent of its normal water allocation this summer and had to tap its deep wells and cut production during the summer to keep research projects on track. California's long-fiber cottons allow manufacturers to make luxurious high-thread-count linens and soft yet strong t-shirts. But around the world, consumers are keeping their clothing longer and opting for lower-quality cotton products that don't depend so much on California's superior product. "Part of it is the varieties and part of it is the climate, but one of the things that California still can do better than just about anybody is produce a world-class-quality cotton crop," Hutmacher said. Third-generation cotton farmer Steve Wilbur of Tulare hasn't given up hope. "There is a future, we just don't know what it looks like," he was quoted. California's white gold, aka "King Cotton," took a significant hit in 2008. According to CDFA, cotton revenue dropped $61.5 million and 48,000 cotton acres were abandoned or went unplanted. 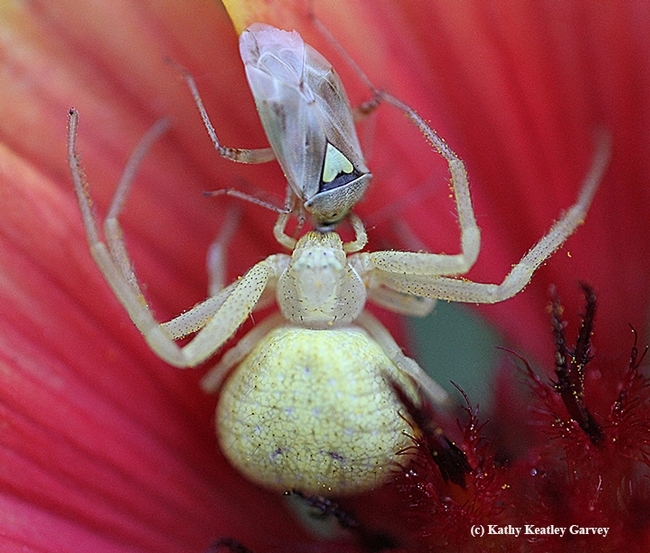 Cotton growers comitted to pressing on attended a recent cotton field day at the UC West Side Research and Extension Center, which was covered by freelance writer Marni Katz for Western Farm Press. “I know you guys who have survived up to this point are the cream of the crop," the article quoted Ed Barnes, ag research director of Cotton Inc. “You really are dealing with a situation here that is unlike anywhere else in the country." IPM advisor Pete Goodell spoke about the need to address lygus regionally, rather than on a farm-by-farm basis.“The community has to manage the IPM landscape. This is a community problem and it’s going to require a community solution," he was quoted. Field crops specialist Jeff Mitchell addressed the use of conservation tillage in cotton production. "The key to success, he said, is to plant into adequate moisture and use starter fertilizer to help establish the crop," Katz wrote. Farm advisor Dan Munk discussed new guidelines for irrigating Pima and Acala cotton under "new water realities," such as drought and shortages due to water diversion. Cotton specialist Bob Hutmacher said UC is re-examining nitrogen recommendations for cotton given rising fertilizer costs and diminishing returns for cotton. “Under quite a few different rotations, such as lettuce or others, there may be opportunities to back down on N applications without impacting cotton yields,” Hutmacher was quoted.